There are many things that go into a strategy – branding, types of content, defining your target market, and more, but even if you’ve figured all of that out, you still don’t really have a strategy. What you have is direction, a starting point. Creating a results driven social media strategy requires defining your sales goals, then figuring out what it’s going to take to reach it. Even if you have the best branding and along with your target market defined, you still don’t really know what it’s going to take to hit your goals. Yes social media is fun and can be visually appealing, but when you break it down to the nuts and bolts, its core is an algorithm made up of conversion rates and metrics. As the saying goes, “social media can be a numbers game”. You need to understand your metrics, calculate your odds, then develop a strategy to manipulate your chances to get the outcome you’re looking for. Before you can get started, you’ll need a few numbers from your media accounts and Google Analytics. What is your average sale? i.e. what is the average total purchase you made from your website last month? What is your click through rate? i.e. what is the percentage of people that see your social media content, then click through to your website? What is your purchase rate? i.e. of those people who went through to your site from social, what is the percentage of people that purchased from you? What is the average reach of your organic Facebook posts? i.e. how many people see each post before advertising is applied? Take a look at your last 10 sales, add the total cost up, divide by 10. Let’s use Facebook for this example. Take a look at your last 5 organic Facebook posts (not-boosted or paid ad), add up the total reach from each post, then divide by 5. If you don’t have this number available, 2% is a good standard number to try using as an example. You’ll need to have Google Analytics goal-tracking set up to know which of your eCommerce sales are coming in through social media. If you do, follow this route: take the number of sales via Facebook from the past month and divide it by the unique users from Facebook who visited your site in that same month. If you don’t have this number available, then 1-3% is usually a standard number to try using as an example. Got the numbers? Okay, let’s move on! Now that you know what your conversion rates, average sale, and average reach, you can use these numbers to figure out how much social media content you need to write to hit your revenue goal. For example: Pretend the business Cotluck Ponsulting has an average reach of 100 people each Facebook post, a click through rate of 2%, and a purchase rate of 5%. That would mean that to hit a revenue goal of $2,000, its page content would need to be seen by over 20,000 people. Don’t glaze over yet – we have something for you so you don’t have to do the formula yourself. Stay with me. So in order for Contluck Ponsulting’s content to be seen by 20,000 people to make $2,000 they would need to write 200 Facebook posts a month without paid advertising. Stop right there! Not only is writing 200 Facebook posts a month totally unrealistic in terms of time, it would absolutely provide a negative result for your page. Both real people and algorithms don’t like when your flood their feed. X this option out. Moving on. As you can see above, with just a bit of paid advertising, you can write a totally reasonable amount of content and add a bit of (strategic) paid advertising to get the result you need to make your revenue goal. So how much does this actually cost? 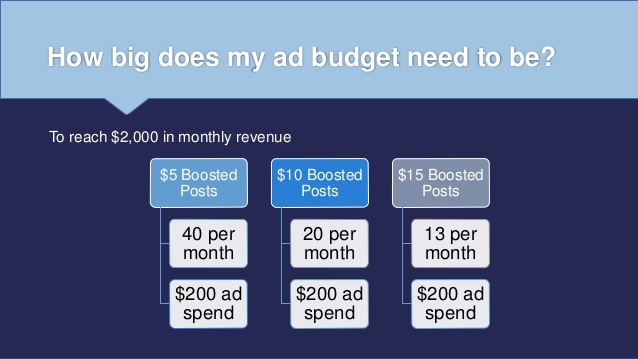 So how much money do you really need to spend on paid advertising to hit your revenue goal? Well, this would depend on all the numbers you already pulled – click through rate, purchase rate, and average sale. In each of these hypothetical Cotluck Ponsulting scenarios (above), with the same ad budget you can get the same revenue result! 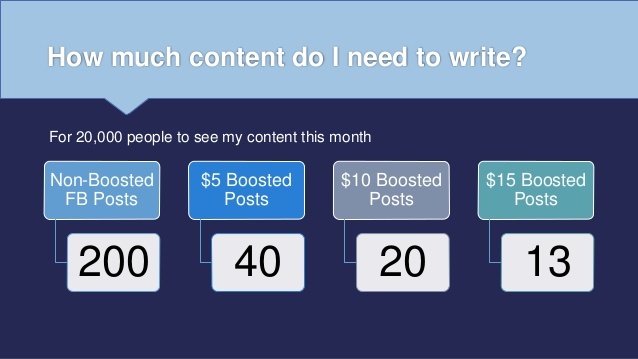 Rather than spending time writing 40 posts and boosting them for just $5, it makes much more sense to write 13 high-quality interesting posts each month and increasing your budget to $15 per post. This is a win-win situation. Your followers are happy because they’re not getting boring fluff content in their feed, your social media manager will be happy because they don’t need to write an uneccessary amount of content, and the head honcho will be happy because the team is being efficient and reaching revenue goals. Today’s social media atmosphere is a pay-to-play environment. If you want to have control over reaching your revenue goals via social media, then you need to invest in paid advertising. Unless you’re super crafty, come up with some off-the-wall unique campaign, or have a rolodex of high-dollar contacts to team up with, it just won’t happen. Social media is a tool and you need to use it wisely. The conversion rates and numbers are certainly not easy for everyone. We’ve created an Ad Budget & Content Calculator! To use it, you’ll need to know the metrics listed in the shopping list above, plop them into the indicated areas on the sheet, and voila! You have your estimated ad budget. You need to invest in paid advertising if you have serious revenue goals for your social media efforts (which you should). You need to know your numbers to create a real strategy that produces results, otherwise it’s just a fluke. Don’t be afraid to use your entire ad budget. If your calculations are correct, your site is well-built, and you know your target market, you should be in good shape! ….and if it’s not for you, you know someone who can help. Send us a note, we’re pretty handy. Each business has a different product, website, and market which may affect your results when using these formulas. Let us know in the comments what you think about our calculator, questions regarding the strategy, or anything you’ve found useful to know when creating your own strategy. Wishing everyone luck on their results driven social media strategy development! This presentation was originally created as a three part series for The Hivery, presented by yours truly (Rose Souders). If you’d like this presentation given at your organization or group, please send us a note and we can discuss further.